Verschiedene Forschergruppen bringen die Rekord-Dürre in Kalifornien mit dem menschengemachten Klimawandel in direkte Verbindung. Seit drei Jahren vertrocknen ganze Landstriche an der US-Westküste. Forscher machen den Klimawandel mitverantwortlich und sagen noch schlimmere Szenarien voraus. Felder liegen brach, Rasenflächen vertrocknen, seit 2012 sind die üblichen Winterregen fast ausgeblieben – Kalifornien leidet seit drei Jahren unter extremer Dürre. Der vergangene Januar war in vielen Teilen des US-Bundesstaates der trockenste seit Beginn der Wetteraufzeichnungen in den 1870er Jahren. Sommerlich warm ist es vielerorts noch zusätzlich. Wüstenbildung – ein Problem der Entwicklungsländer? Lange nicht mehr! Ausgetrocknete Seen, geschwärzte Luft durch Waldbrände und dürre Felder sind keine Seltenheit mehr in Kalifornien, Spanien oder China. Wir erklären, welche Weltregionen durch den Klimawandel versanden. Zeit für einen Faktencheck. Was ist dran an der klimatischen Dürrekatastrophe in Kalifornien? Zunächst einmal schauen wir dazu in die offiziellen Niederschlagsdaten der NOAA aus Kalifornien (Abbildung 1). Abbildung 1: Entwicklung der Jahresniederschläge in Kalifornien während der letzten 120 Jahre. Quelle: NOAA. Abbildung 2: Entwicklung der Winterniederschläge in Kalifornien während der letzten 120 Jahre. Quelle: NOAA. Es wird klar: Immer wieder hat es ein paar Jahre in Folge mit schwachem Winterregen gegeben. What’s new? Kurioserweise hatte das National Climate Assessment in seinem Bericht von 2014 sogar noch eine Zunahme der Jahresniederschläge in Kalifornien während der letzten Jahrzehnte beschrieben. California has experienced severe drought in 2012–2014 (which appears to be continuing into 2015), with especially low winter precipitation and mountain snowpack in winter 2013–2014. However, the extent to which climate change is implicated in the drought, if at all, is not clear. By applying modeling and statistical approaches, we construct a historical record of California snowpack, runoff, and other hydrological variables of almost 100 years in length and use the reconstructed records to analyze climate trends in the Sierra Nevada and their impact on extreme drought events in the historic record. We confirm a general warming trend and associated decreasing trends in spring snowpack and runoff. We find that the warming may have slightly exacerbated some extreme events (including the 2013–2014 drought and the 1976–1977 drought of record), but the effect is modest; instead, these drought events are mainly the result of variability in precipitation. A suite of climate data sets and multiple representations of atmospheric moisture demand are used to calculate many estimates of the self-calibrated Palmer Drought Severity Index, a proxy for near-surface soil moisture, across California from 1901 to 2014 at high spatial resolution. 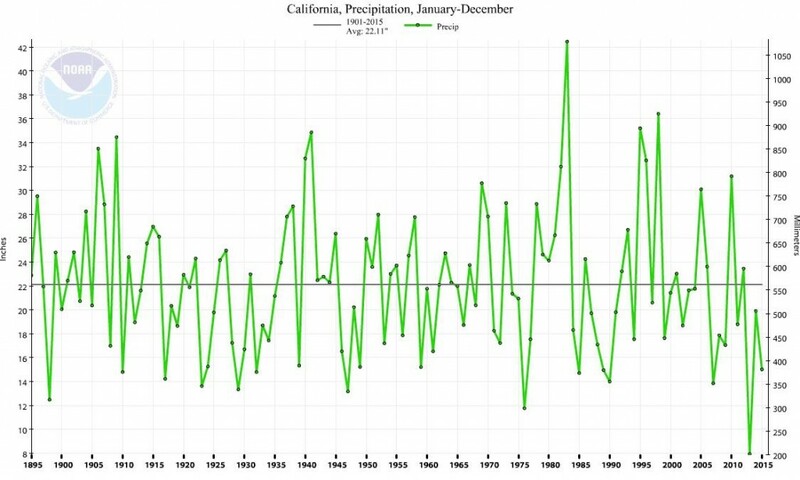 Based on the ensemble of calculations, California drought conditions were record breaking in 2014, but probably not record breaking in 2012–2014, contrary to prior findings. Regionally, the 2012–2014 drought was record breaking in the agriculturally important southern Central Valley and highly populated coastal areas. Contributions of individual climate variables to recent drought are also examined, including the temperature component associated with anthropogenic warming. Precipitation is the primary driver of drought variability but anthropogenic warming is estimated to have accounted for 8–27% of the observed drought anomaly in 2012–2014 and 5–18% in 2014. Although natural variability dominates, anthropogenic warming has substantially increased the overall likelihood of extreme California droughts. How Has Human-Induced Climate Change Affected California Drought Risk? The current California drought has cast a heavy burden on statewide agriculture and water resources, further exacerbated by concurrent extreme high temperatures. Furthermore, industrial-era global radiative forcing brings into question the role of long-term climate change with regard to California drought. How has human-induced climate change affected California drought risk? Here, observations and model experimentation are applied to characterize this drought employing metrics that synthesize drought duration, cumulative precipitation deficit, and soil moisture depletion. The model simulations show that increases in radiative forcing since the late nineteenth century induce both increased annual precipitation and increased surface temperature over California, consistent with prior model studies and with observed long-term change. As a result, there is no material difference in the frequency of droughts defined using bivariate indicators of precipitation and near-surface (10 cm) soil moisture, because shallow soil moisture responds most sensitively to increased evaporation driven by warming, which compensates the increase in the precipitation. However, when using soil moisture within a deep root zone layer (1 m) as covariate, droughts become less frequent because deep soil moisture responds most sensitively to increased precipitation. The results illustrate the different land surface responses to anthropogenic forcing that are relevant for near-surface moisture exchange and for root zone moisture availability. The latter is especially relevant for agricultural impacts as the deep layer dictates moisture availability for plants, trees, and many crops. The results thus indicate that the net effect of climate change has made agricultural drought less likely and that the current severe impacts of drought on California’s agriculture have not been substantially caused by long-term climate changes. The Examiner berichtete über die Arbeit („Study shows climate change made Calif. drought less likely to occur“). An analysis of the October 2013–September 2014 precipitation in the western United States and in particular over the California–Nevada region suggests this anomalously dry season, while extreme, is not unprecedented in comparison with the approximately 120-yr-long instrumental record of water year (WY; October–September) totals and in comparison with a 407-yr WY precipitation reconstruction dating back to 1571. Over this longer period, nine other years are known or estimated to have been nearly as dry or drier than WY 2014. 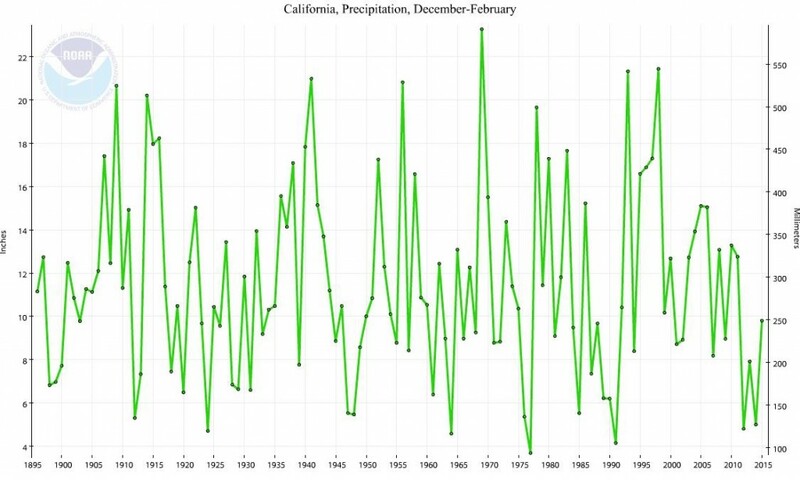 The 3-yr deficit for WYs 2012–14, which in California exceeded the annual mean precipitation, is more extreme but also not unprecedented, occurring three other times over the past approximate 440 years in the reconstruction. WY precipitation has also been deficient on average for the past 14 years, and such a run of predominantly dry WYs is also a rare occurrence in the authors’ merged reconstructed plus instrumental period record. According to a new NOAA-sponsored study, natural oceanic and atmospheric patterns are the primary drivers behind California’s ongoing drought. A high pressure ridge off the West Coast (typical of historic droughts) prevailed for three winters, blocking important wet season storms, with ocean surface temperature patterns making such a ridge much more likely. Typically, the winter season in California provides the state with a majority of its annual snow and rainfall that replenish water supplies for communities and ecosystems. Further studies on these oceanic conditions and their effect on California’s climate may lead to advances in drought early warning that can help water managers and major industries better prepare for lengthy dry spells in the future. “It’s important to note that California’s drought, while extreme, is not an uncommon occurrence for the state. In fact, multi-year droughts appear regularly in the state’s climate record, and it’s a safe bet that a similar event will happen again. Thus, preparedness is key,” said Richard Seager, report lead author and professor with Columbia University’s Lamont Doherty Earth Observatory. Zum guten Schluss: Noch 1976 hatten Klimawissenschaftler einen ganz anderen Bösewicht im Verdacht, der für die bereits damals episodisch auftretenden Dürren verantwortlich sein sollte: Die globale Abkühlung! Schön dokumentiert von Climate Depot in historischen Zeitungsausschnitten.